Cat photos continue to abound as I continue my quest to find the conditions under which the phone camera will approximate decent results. So... This one was last night; Julia was lecturing me about spending too much time fussing with the computer and not enough time fussing with her. 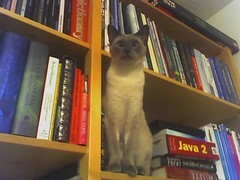 Troublemaker or world's cutest bookend? You make the call. Music: Nine Inch Nails - "Leaving Hope"